How cool does that sticker banner look!? It will look even better on my now 'Award Winning' novel - Enter Eternity and in my hands! I can't even believe I can sit here and actually write this! When I first started writing Enter Eternity, I knew exactly how and where Jillian's journey would take her. Her past lives already embedded in my muse, I allowed her to tell the story. Somewhere inside me, Jillian lives and without divulging where she goes next, all I can say is there is more to come! I hope to live up to Enter Eternity's recognition and bring on a second award! Wouldn't that be great! As authors, we all strive to put our words into what we feel is our best work. We hear from others their kind words, how much they enjoyed the novel and I have to say how much I appreciate those words! This award solidifies their words in the best way possible! Am I doing a happy dance? Damn straight!! Just look at that bling!! Last week turned out to be a great week! Participating in the Rave Review's Book Club -- Pay It Forward on Twitter and Blogging to promote some very talented authors was a huge success! I would like to thank everyone who was given my name for promoting Enter Eternity & Fool Me Once -- I saw huge numbers on my blog and a great many new followers on Twitter because of your efforts! THANK YOU! During the RRBC Pay It Forward Event, I was sent news that I received a new review for Enter Eternity! Sticking to the guidelines of Pay It Forward, I could not promote this great news. So this week I will be promoting all the links where you can find out about my 5* review from @cluelessbutdumb (twitter handle) Mr. Erik Nelson! Understanding EE is up for two Indie Awards, this gentleman took on EE -- SQUEEZING me into his very tight schedule. I truly didn't know what to expect and waited anxiously for his opinion. I can't tell you how pleased I am to have found Erik! I've been down that path -- searching, sending emails (over 100), going through twitter and yes, joining RRBC! I have been told by others that they loved EE -- some family, some friends. If you are like me, although I appreciate their comments and support, nothing is better than hearing that from someone who knows nothing about you and is not related to you. Needless to say, I was on cloud 9!! Now that the Pay It Forward week is over, I can promote myself once again -- so here I am promoting!! Please SHARE, LIKE, FOLLOW, whatever you are comfortable with my exciting news! Here are the links! Thanks bunches for all those who participated last week, I hope you enjoyed and grew from the event. Hopefully, I did my group of authors proud!! This is the last day of the PAY IT FORWARD run for Rave Reviews Book Club! It has been a whirlwind ride and I have had five truly gifted and talented authors to support! I have spent time on their blogs, FB sites, and amazon learning so much more than I thought I had known about my fellow authors! It's time for Indie Authors to break into the world and with your support we are on the very edge of succeeding! My final author today is Robin Chambers!! I'm thrilled to end my week with an Author I truly look forward to reading! He has several novels that have received outstanding 5* reviews and I can't wait to dive in! Along with - Amazing Grace - Book 2 and so many others! This is one author whose work I know I will enjoy! Please check out his Bio: http://www.amazon.com/Robin-Chambers/e/B00CYLM20O/ref=sr_tc_2_0?qid=1430500048&sr=1-2-ent with the complete list of his works!! I would like to say thank you to all who participated in this RRBC PAY IT FORWARD WEEK! Your support has been the most amazing support and I truly appreciate the time each of you spent dedicating blogs and social media posts for me. As always, RRBC is welcoming Indie Authors to join this supportive group. If you are interested, please JOIN HERE: https://ravereviewsbynonniejules.wordpress.com/join-here/ and remember to tell them HONEY sent you! It is Day 4 and things are going great!! Thank you all for checking out these super authors! Being an Indie Author sometimes means our support comes from people we don't know. The folks at Rave Reviews Book Club are doing their very best to make sure we all get that great support! With that said, please let me introduce to you Jan Hawke. Jan's latest novel - Milele Safari: An Eternal Journey is available now! This is only one of the amazing authors involved in the RRBC! You will find many more when you visit https://ravereviewsbynonniejules.wordpress.com/book-club-selections-for-review/ SELECT the genre you enjoy and please SUPPORT INDIE AUTHORS!!! Now we move on to day 3!! I hope you are all enjoying checking out these amazing authors so far -- there's still a few more days left so stay tuned!! Today, we change pace, I think. Let me introduced Lizzie Chantree and her novel BABE DRIVEN. https://www.facebook.com/lizziechantree?fref=ts Please stop by and LIKE her page! Her twitter handle is @Lizzie_Chantree -- give her a follow! Don't forget to check out her Blog -- http://lizziechantree.com/. Check out all the great authors and join -- tell then Honey sent you!! You won't regret it! This should be a great week for RRBC and I hope everyone is enjoying sharing these great authors as much as I am! Please check my twitter feeds if you missed any links - and stay tuned for tomorrow -- another Author takes the stage!! Today starts the beginning of everything new! A new job, a new laptop, a new place to live! Why not add to that list a new way to promote fellow RRBC members. All great Indie Authors who deserve a serious peek at their work. This week, Rave Reviews Book Club members will be supporting each other via Twitter, FaceBook, and Blogs -- so please check out the great list I have the pleasure of sharing! Tuesday -- Rhani D'Chae -- SHADOW OF THE DRILL; Born of Circumstance, Bred for Revenge. Here's hoping everyone shows support for our fellow authors!! Tomorrow I will have a new Author to share info with you! Check back in and check twitter for more great links and info!!! I was recently tagged in J.V. Carr's blog and am ready to divulge my fave top 10!! My all time favorite movie... EVER -- my two favorite characters! What can't be said for these characters? Neytiri, the teacher -- Sully, the student -- thrown into a world he had to adapt, learn, betray and protect -- there is just nothing better -- IMHO! Now, let's go back a bit! If you don't know this one *shakes finger* - shame on you! I have seen some great movies but, this one, by far, outdoes them all! John Cleese in his multi-roles - Sir Lancelot the Brave, The Black Knight, the Taunting French Guard -- to name a few!! Think this is my favorite scene! Hugh Jackman as Wolverine!! I would post my whole blog with this but I'm sure you would tire of seeing it long before I would tire posting it!! Let's jump to a few of the ladies in character! One I absolutely love is Donna -- Mama Mia!! She is an inspiration to single mom's everywhere who struggle through life (though, not on a Greek Island!) raising their child(ren) and hoping one day to find love again! I give you Meryl Streep -- not only one of my favorite roles -- my favorite actress to boot!! My Dancing Queen!! Sandra Bullock can play no bad roles in my eyes! She blew me away as Dr. Ryan Stone in Gravity! I cannot go without giving much credit to another one of my favorites -- and in many different roles -- this one just happened to capture me a bit more than some of his others! Orlando Bloom as Legolas in Lord of the Rings! DAMN - he's... perfect! Going back a few years again. Morgan Freeman has delivered many amazing roles -- it just so happens that one of his roles falls into my top 10!! Hoke Colburn - Driving Miss Daisy! He was so much more than just her driver!! Think I'm at the end of my Top 10 screen character fave's!! This final one I could watch 1000 times and never tire of it! There they are!! My Top 10 -- in random order because I just couldn't decided how to rank them and since ranking was not a requirement, I decided to pull numbers with them!! There are undoubtedly so many more I could have listed here and it took me a while to really figure out which ones were actually my favorite ones. I wonder who your Top 10 would be if you had to choose!! Let me know -- if you want to tackle the assignment -- please feel free to do so!! Or you can leave a comment here if you so choose!! Consider yourself tagged!! Thanks again to J.V. Carr for the challenge! Hope I join you again another time!! Get ready folks!! It's time for my Goodreads Giveaway!! 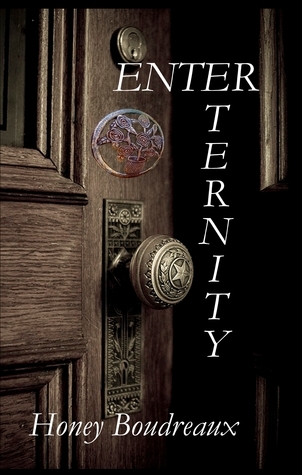 I have two copies of ENTER ETERNITY that will be up for grabs one month from now! Get in on the action and head over to Goodreads to enter to win your copy! It will be starting midnight tonight 8/5/14 and running through 9/5/14 so you have time -- but don't wait too long! I will do something even better! If you have visited my blog, and you are reading this, and you are the winner -- send me a tweet! Let me know you liked my author page on FB facebook.com/AuthorHoneyBoudreaux and I will write a personal message to you with your winning signed copy! Don't miss out on this giveaway and special signed message inside!! BE SURE TO 'LIKE' MY FB PAGE TO QUALIFY! Giveaway ends September 05, 2014.